This might seem strange coming from someone working in technology consulting, but here goes: Technology alone does not provide business solutions. It’s people who define solutions and the role of technology in those solutions. When technological changes are grounded from the needs of the people they are designed to support, that is when true value is unlocked. Technology consulting is about solving problems; it’s about being both creative and analytical, and most importantly, it’s about connecting with people. This is why I’m passionate about my career in SAP. My Accenture leaders understand that it’s a passion that goes beyond my day job. 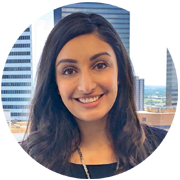 They allow me to use this passion to make a real difference not only at Accenture, but also in my community in Houston, and I am still able to maintain a good balance between my work and professional life. SAP is an exciting space. It’s about transforming organizations and freeing people’s time to do other work. I’m currently working with Environmental Health and Safety solutions, and get to see the real impact of this work—making workplaces safer, preventing accidents and driving the importance of safety in the oil field. I’m involved in large design, build and implementation projects for upstream oil and gas clients, using SAP. This means working with my clients to understand their requirements, knowing how the technology can help and ultimately implementing a change to solve the problem. That’s why people, with their creative and analytic sides, are the “sweet spot” of technology consulting. Accenture offers so much to our clients and our people, with multiple ways to get involved in the digital and technological realms that are disrupting our day-to-day lives. We have an entire Innovation Architecture, from our research and labs to our Innovation Centers. I helped build some of the demonstrations at our Houston Innovation Hub, which help show our clients the actual applications for technologies like artificial intelligence, analytics and blockchain. I take part in a lot of campus recruiting, so I am able to explain to students why technology consulting is an exciting career path. I studied civil engineering, and students often ask why me why I pivoted from engineering to consulting, or how I knew that was the right choice. Well, the thing is, I haven’t fully pivoted. I still use problem-solving skills I gained from my background in engineering in my consulting role, which also offers me so much flexibility. I keep in touch with a lot of the students I met on campus after they join Accenture. These students have lots of enthusiasm and even more questions, and I encourage them to connect with me regularly. I share what I know—not just about technology, but also about how to develop their strengths into a career path that they want. Through our strengths finder assessment, I found that my top strength is the ability to Win Others Over (or WOO, as we call it). At first, I thought that my strengths did not lend themselves well to my job—they were mostly centered around relationship building, not necessarily executing. That’s when I realized: It’s my interpersonal skills that have gotten me to where I am. I really do love making connections with new people or sharing what I’ve learned over the years and teaching someone something new about where their career could go. That’s why I actively got involved in Accenture’s Houston People Council, focused on helping those new to the firm find their place. After being on this council for a few years, I jumped at the opportunity to become the chair of the council’s Integration Committee. It can be difficult understanding how to navigate your career in an organization the size of Accenture, which is why groups like these are so important, especially for newcomers. I guide new associates to make the right connections and have the right conversations. Helping people integrate into the company and understand how we work is crucial to helping people grow in their careers. I recently received an award from the Houston Young Professionals and Entrepreneurs (HYPE) Group, for my contributions to Houston’s community, both through my work at Accenture and in other activities I am involved in outside of my day job. You might be wondering how I find time to do all these extra activities—for starters, I’m able to work on local projects and no longer do a lot of traveling for work. That’s the thing with Accenture: There are opportunities to travel if you want, or you can stay close to your home base if you prefer. My team understands the importance of this, and I am even able to block out some time on Fridays to participate in non-client work. I am happy to say that I have a good work-life balance; I’m usually heading home by 6 p.m., even though sometimes I need to work in the evenings on mentoring or recruiting. I see this as time well spent, as these are activities that are important to me, and I enjoy helping my fellow teammates and associates. It’s important to keep things in perspective. Here’s one trick that works for me: I started to leave my laptop charger at work. My laptop will stay charged for three or four hours, so I never spend longer that than working at home, and most of the time, it is more than enough! Transform the way the world works and lives with the work you do every day. Find your fit with Accenture.